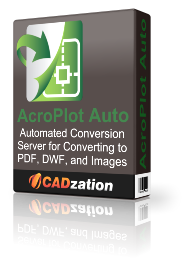 AcroPlot Auto takes conversion one step further and allows you to automatically convert entire drives to PDF or DWF on a continuous basis or at a scheduled time each day. Create watched project folders for AcroPlot Auto to monitor at various intervals and create updated PDF, DWF, or TIFF files daily. AcroPlot Auto does provide for the same high quality image output as AcroPlot Repro so many of our Reprographics customers have found it useful to use AcroPlot Auto to watch folders and convert the files automatically and then load the image files into their Reprographics program.